Reassemble an ancient Dwarven vamidium. Activate the Broken Dwarven Horse outside Runoff Caverns. Enter the Autumn's Bells section of the dungeon. Locate the Horse Right Front Leg next to the dead mercenary in the entrance hallway. Locate the Horse Left Back Leg in the main chamber, near the field of Glowing Red Wheat. Cross the bridge in the main chamber and locate the Horse Right Back Leg between the fields of Sickly Green Wheat and Orange-Encrusted Wheat. Locate the Horse Left Front Leg up on a pedestal along the southern wall of the main chamber. 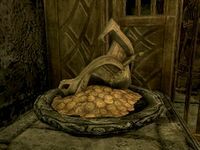 Place enough harvested wheat in the depositors to open the chamber containing the Conduit Control Gem and grab the Horse Head found within. Return outside and activate the broken horse to obtain your own Dwarven Horse mount. Unlike most quests added by Creation Club, this one does not automatically begin upon installing Forgotten Seasons. Instead, you must travel to the entrance of Runoff Caverns, which will already be marked on your map. 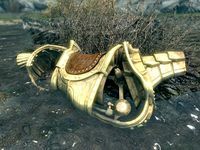 Outside, you will find a "Broken Dwarven Horse", a metallic Dwarven torso lying partially submerged in a stream. Activate this object to begin the quest, which will task you with assembling the pieces to reconstruct this strange equine construct. All of the parts can be found in the Autumn's Bells section of Runoff Caverns, which is found deep inside, within the Dwarven ruins of Vardnknd. You will need to traverse the entirety of the Runoff Caverns section of the dungeon to reach the hub area at Vardnknd Gallery. The entrance to Autumn's Bells can be found in this central chamber. The first part of the horse is easy to find: it is the Horse Right Front Leg, and can be found next to the dead mercenary in the entrance hallway of Autumn's Bells. You will likely come across this mercenary while completing the Forgotten Seasons quest. The Horse Left Back Leg can be found in the main chamber, near the field of Glowing Red Wheat. It is on the far side of the field when approaching from the entrance hallway. The Horse Right Back Leg is on the other side of the main chamber, which will necessitate crossing the bridge in the center. It can be found between the fields of Sickly Green Wheat and Orange-Encrusted Wheat. The Horse Left Front Leg can be found up on a pedestal along the southern wall of the main chamber. The final piece of the horse will necessitate completing the Autumn's Bells puzzle. This can be done by harvesting a large amount of the special wheat found growing in the chamber and placing it in the depositors located back near the field of Glowing Red Wheat. Once enough wheat has been deposited, the chamber containing the Conduit Control Gem will be unlocked and the Horse Head can be found sitting on a pile of gold within. With all five pieces assembled, you can return to the surface and activate the broken torso once again. Doing so will create a functioning Dwarven Horse, which can be ridden as a mount. It takes no damage whatsoever, meaning you can stay mounted on it and avoid all harm. This page was last modified on 20 January 2019, at 12:27.